Last year I went on an Amtrak adventure. Once again, I have redeemed a bunch of rewards points and have put together a 23-night, 7,292-mile trip. Click on the maps to enlarge them. Half a night, breakfast, lunch, dinner, night 1, breakfast, and lunch on the California Zephyr. 6-hour layover in Chicago. 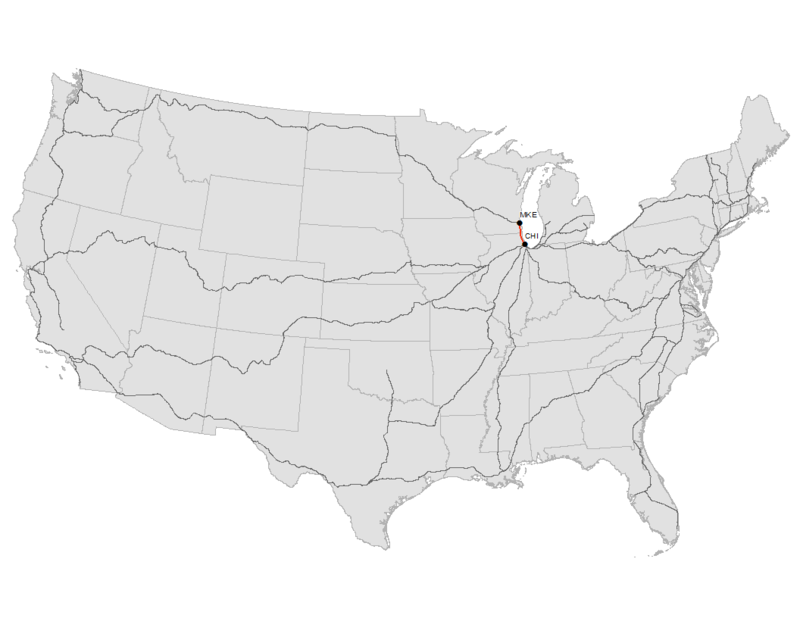 Amtrak layovers are the exact opposite of airport layovers, since you’re downtown. Unless the weather is bad, I’ll go for a ride on Divvy along the river and along Lake Michigan. Night 2, breakfast and lunch on the Lake Shore Limited. Nights 3, 4, and 5 in New York City. I’ll have two full days to enjoy it. 🙂 I’m still trying to figure out whether the subway or CitiBike is my favorite way to experience it. Lunch on the Acela Express. Nights 6 and 7 in Washington. Capital Bikeshare is a great way to experience the nation’s capital. Lunch and dinner on the Palmetto. North Carolina, South Carolina, and Georgia will be states #34, #35, and #36. Nights 8, 9, 10, 11, 12, 13, and 14 in Savannah. I’ll be spending a week here to attend the 26th Congress for the New Urbanism. I’ll also take some rides on CAT Bike. 1-hour layover in Wilson. I probably won’t get to venture far from the station. 5-hour layover in Greensboro. Looks like Lime recently added bikeshare to Greensboro, so I’ll probably give that a ride. Night 15, breakfast, lunch, and dinner on the Crescent. Alabama, Mississippi, and Louisiana will be states #37, #38, and #39. Night 16 in New Orleans. I wish I were going to have more time in New Orleans. Streetcars, the ferry, and Blue Bikes are on my to do list. Dinner on the City of New Orleans. Tennessee will be state #40. Night 17 in Memphis. It’s a huge coincidence that I’ll be arriving in Memphis the day that Explore Bike Share is launched! I’ll bike west across the Mississippi, and Arkansas will be state #41. Night 18 and breakfast on the City of New Orleans. 4-hour layover in Chicago. More Divvy rides. Snacks on the California Zephyr. Night 19 in Galesburg. There’s a place to rent cars next to the train station in Galesburg. Nights 20, 21, and 22 in Nauvoo. I have an aunt and uncle serving a mission in historic Nauvoo, so I’ll be renting a car, since I don’t want to miss the opportunity to visit for free. Dinner, night 23, breakfast, lunch, and dinner on the California Zephyr. After my Amtrak Adventure, I will have visited 41 out of 50 states (or 82%). 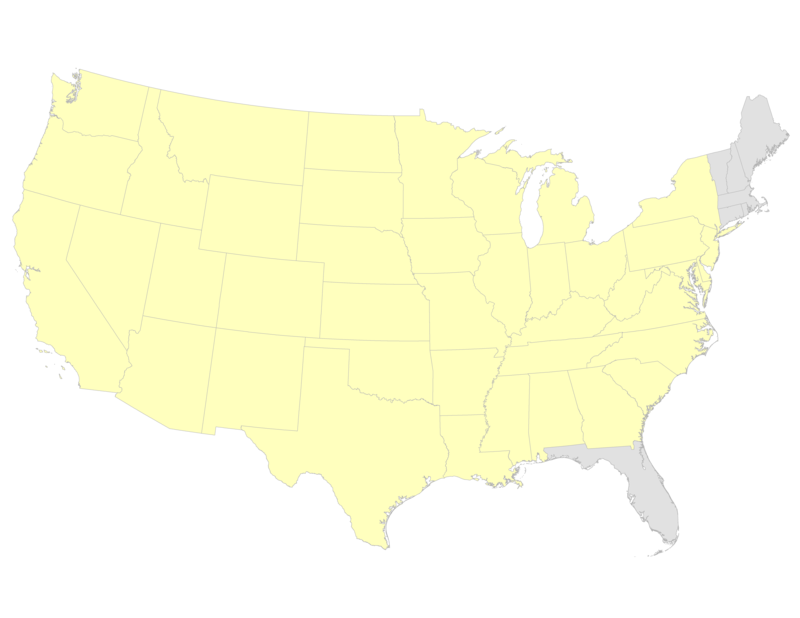 In the map above, the states I’ve been to are in yellow, while the states that I haven’t are in grey. Additionally, I still have yet to visit Alaska and Hawaii. This entry was posted in Land Use, New Urbanism, Transportation on May 5, 2018 by Mike Christensen. One great thing about Amtrak is their rewards program. One great thing about Amtrak’s rewards program is the Amtrak Rewards Credit Card, which earns you points on your purchases that can be redeemed for travel on Amtrak. I have redeemed a bunch of points and have put together a 31-night, 11,453-mile trip the second half of April and first half of May. Click on the maps to enlarge them. Half a night, breakfast, lunch, dinner, night 1, and breakfast on the California Zephyr. Night 2 will be in Galesburg, Illinois. I’ve passed through Galesburg several times on the California Zephyr and have always wanted to take a look around. Staying a night here also allows me to take a ride on the Illinois Zephyr and experience another state-sponsored Amtrak route. Breakfast on the Illinois Zephyr. 5-hour layover in Chicago. Amtrak layovers are the exact opposite of airport layovers, since you’re downtown. Unless the weather is bad, I’ll go for a ride on Divvy along the river and along the lake. Dinner on the Hoosier State. Night 3 will be in Indianapolis, Indiana. I enjoyed Indianapolis when I visited there in October 2015. On that trip, I arrived on the Hoosier State operated with equipment provided by Iowa Pacific. It will change back to equipment provided by Amtrak in March, and I wanted to see how the change works out. Also, the Indianapolis Cultural Trail is one of the best urban ped/bike trails in the nation and is great to explore on Indiana Pacers Bikeshare. Night 4, breakfast, lunch, and dinner on the Cardinal. Kentucky will be state #28. Nights 6, 7, and 8 will be spent in the Big Apple. I’ll have two full days to enjoy it. 🙂 I’m still trying to figure out whether the subway or CitiBike is my favorite way to experience it. Breakfast on the Acela Express. Nights 8, 9, and 10 will be spent in the nation’s capital. I will hopefully arrive in time to participate in the March for Science. I will also be attending the Spring Council Meeting of the National Association of Railroad Passengers. I also love riding around on Capital Bikeshare. Dinner, night 11, and breakfast on the Capitol Limited. 6-hour layover in Chicago. More Divvy rides. Dinner, night 12, breakfast, lunch, dinner, night 13, and breakfast on the Southwest Chief. Missouri, Kansas, and New Mexico will be states #29, #30, and #31. Night 14 in LA. I plan to ride Metro out to Santa Monica and finally experience the Santa Monica pier. I’ll also give Metro Bike Share a try. Lunch, dinner, night 15, breakfast, lunch, and dinner on the Coast Starlight. Nights 16, 17, 18, 19, 20, 21, and 22 in Seattle. I’m in town to attend the 25th Congress for the New Urbanism. Saturday I’m doing the ferry ride and tour of Victoria, British Columbia. Snacks on the Amtrak Cascades. Night 23 visiting my uncle in Tacoma. Snacks on the Coast Starlight. Nights 24, 25, and 26 visiting my mom and stepdad in Longview, Washington. 5-hour layover in Portland. “The dream of the ‘90s is alive in Portland.” I’ll be sure to ride Biketown. Dinner, night 27, breakfast, lunch, dinner, night 28, breakfast, and lunch on the Empire Builder. North Dakota will be state #32. Night 29 in Milwaukee. I made a brief visit in October 2015, and I plan to see more of the city on Bublr. 1-hour layover in Chicago. Just enough time for lunch. Dinner on the California Zephyr. Night 30 in Omaha. My main reason for stopping in Omaha is to make a visit to South Dakota. Early in the morning, I’ll hop on Greyhound and north ride to Sioux City, Iowa, where I’ll rent a bike and ride up the Missouri and Sioux Big Sioux Rivers to North Sioux City, South Dakota, so I can get state #33. In the afternoon, I’ll ride Greyhound back to Omaha and explore on Heartland Bcycle. Night 31, breakfast, lunch, and dinner on the California Zephyr. After my Amtrak Adventure, I will have visited 33 out of 50 states (or two-thirds). 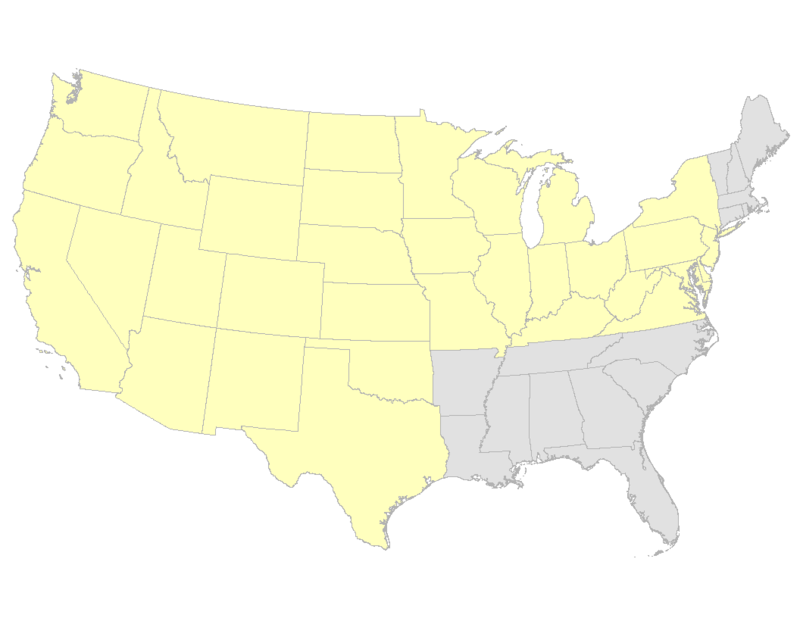 In the map above, the states I’ve been to are in yellow, while the states that I haven’t are in grey. Additionally, I still have yet to visit Alaska and Hawaii. This entry was posted in Land Use, New Urbanism, Transportation on March 19, 2017 by Mike Christensen. Density definitely matters when deciding which transit mode is appropriate (40-foot bus on an hourly headway vs. a ten-car subway train on 5-minute headways), especially for local trips. However, the longer the journey, the less density surrounding the stations will ridership levels. If this density fallacy were true, only the people living around airports would fly! This is one of the typical arguments put forth by Randal O’Toole and others at the Cato Institute. It makes several false assumptions. 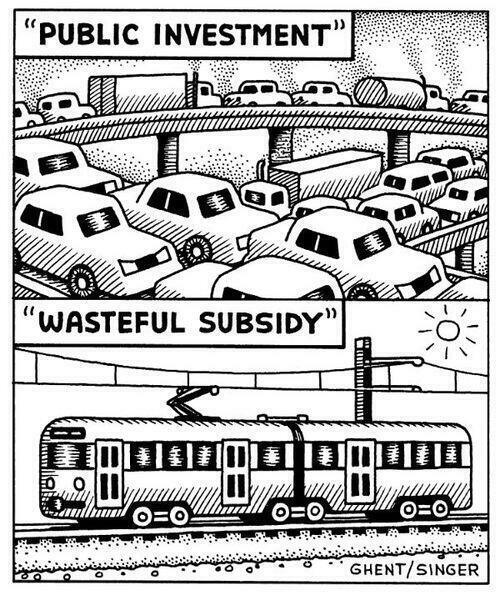 Chief among them are that the system of cars and highways: 1. works well, 2. pays for itself, 3. exerts no negative externalities on society, 4. is accessible to all, and 5. is what people want. 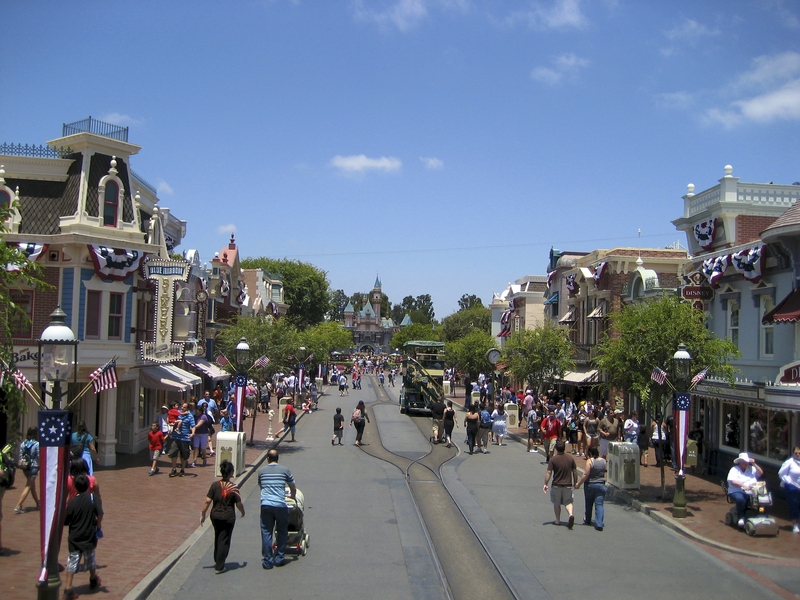 Every year people pay a lot of money to visit highly walkable places like Disneyland. These places tend to be visited more by those Americans living in the less walkable suburbs. When it comes to biking, all I have are two words: Amsterdam and Copenhagen. This one especially bothers me, since I’ve seen transit proposals die because of it. It shows how wild people will allow their imaginations to run, while at the same time denying themselves the benefits that should be blatantly obvious to them. 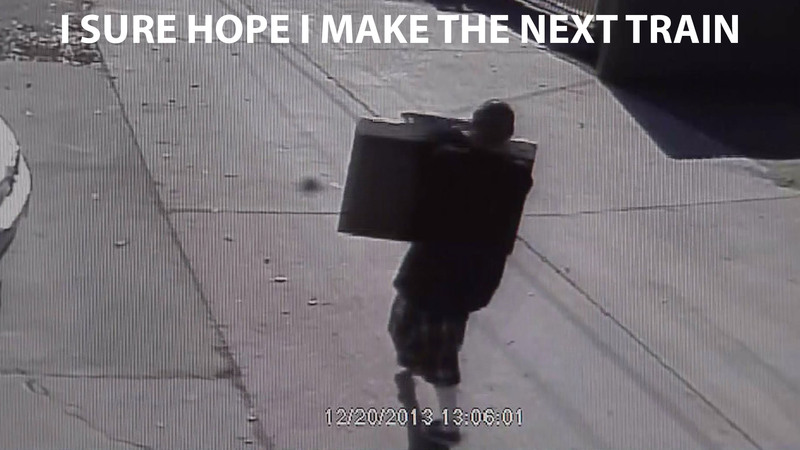 Somehow I just can’t imagine someone breaking in to a home, stealing a TV, and then riding away on a train! This entry was posted in Land Use, New Urbanism, Transportation on January 6, 2015 by Mike Christensen. Just as the debate over whether Pluto qualifies as a planet continues to rage, so rages the debate over whether Salt Lake City’s S-Line qualifies as a streetcar or as light rail. 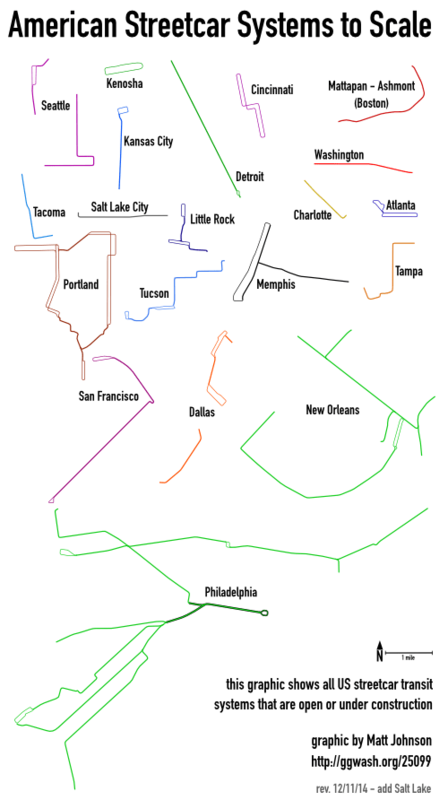 Yesterday Matt Johnson of Greater Greater Washington published an article titled “See America’s streetcar systems at the same scale” which featured the following beautiful diagram. Noticeably missing from the list is Salt Lake City. Matt was nice enough to include the following explanation for its absence. The Sugar House “Streetcar” in Salt Lake City is really a light rail service, though it’s branded as a streetcar by the agency. 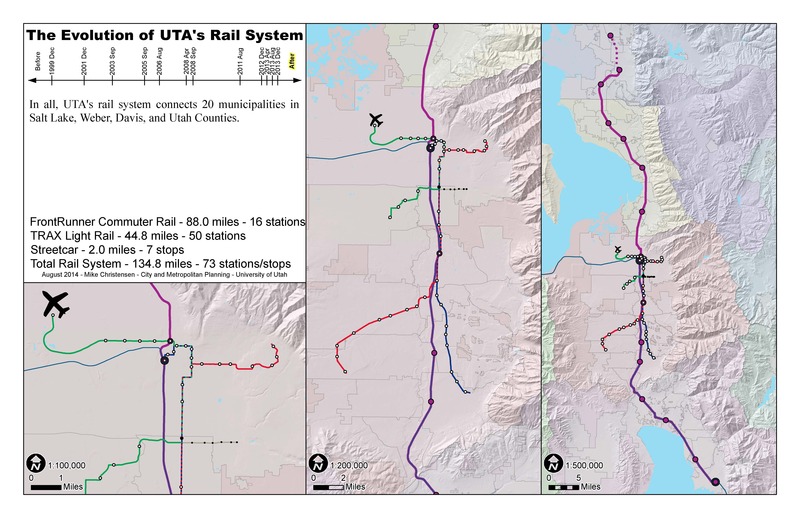 Since it runs in an exclusive right-of-way and uses the same vehicles as the rest of Salt Lake’s light rail system, I did not include it in the map. @MRC_SLC Actually, we duplicated our effort. I updated the graphic a half hour ago to include the Sugar House line. This entry was posted in Land Use, New Urbanism, Transportation on December 11, 2014 by Mike Christensen. This afternoon I discovered an article titled “The 10 highest sales-generating malls in the U.S.” on Fortune. I instantly became curious what these malls’ relationship was with walkability. Almost as instantly I realized that Walk Score could allow me to quickly quantify the malls’ relative walkabilities. Obviously Walk Score is not a perfect system for evaluating walkability. I feel that it is too heavily weighted towards nearby amenities and doesn’t pay enough attention to the quality of the walk. However, it does provide quick results and makes it simple and easy to compare locations. This entry was posted in Land Use, New Urbanism, Transportation on October 29, 2014 by Mike Christensen. 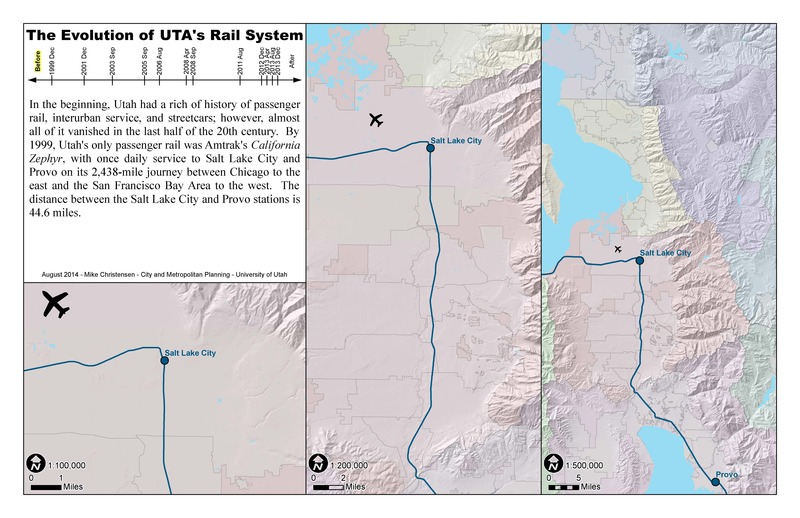 The Utah Transit Authority will celebrate the 15th anniversary of the opening of its first light rail line in December 2014, which started with a 15-mile segment and quickly expanded to the beautiful 135-mile system that we have today. Since no one has taken the time to actually put together a document to chronicle the system’s expansion, I decided to take on the task and am now releasing the draft that I put together in August. I’m still wanting to make some tweaks on the map and would appreciate feedback. 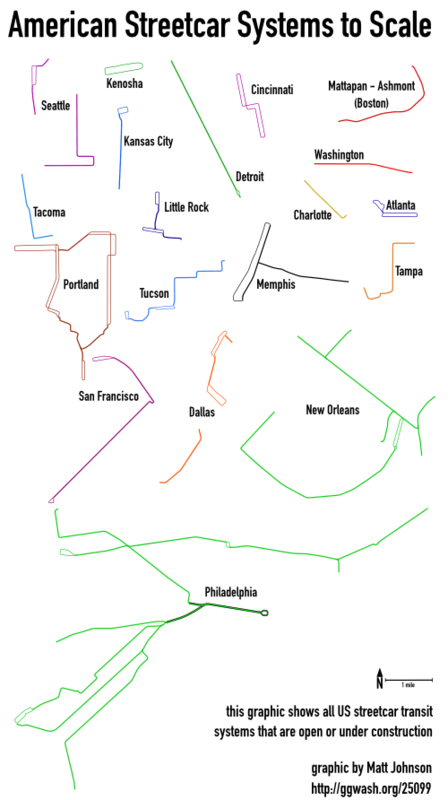 Even though my creation isn’t the typical transit map since it’s been created to scale, I’m also hoping to get some feedback from Cameron Booth of Transit Maps. I chose a scale map rather than a schematic diagram, since I wanted to give viewers an idea of the actual distances being connected by the rail system. For those who are interested, I created it using ArcGIS with data from Utah’s AGRC combined with my own knowledge and a few details clarified using Wikipedia. This entry was posted in Land Use, New Urbanism, Transportation on October 25, 2014 by Mike Christensen. Lately I’ve been pondering on the effects of sprawl on my own religious community. Chuck Marohn at Strong Towns is partially to blame for this. I enjoy that he speaks openly about his own religious background as evidenced by two recent posts: in “Living in Communion,” where Chuck discusses the impact of the built environment on his local congregation, and in “The Cost of Transition,” which directed my attention to Pope Francis’ Apostolic Exhortation from last November, wherein the Pope makes very clear his feelings toward “a financial system which rules rather than serves” and other ills of inequality plaguing our society. While I’m going to keep this post secular, I feel strongly that religion still holds an important place in society. My dad is an electrical engineer, who is also religious. He raised me to look at the world in pluralistic manner, for which I will always be grateful. Rather than seeing science and religion as contradictory, I see the two as complimentary and appreciate multiple perspectives. But enough on that. Before I can explain how sprawl impacts my own religious community as a member of the Church of Jesus Christ of Latter-day Saints, or LDS Church (AKA the Mormons), I need to give a brief overview of the basic structure of the church and how strongly tied it is to geography. The basic congregation of the LDS Church is the ward, which usually consists of around 250 active members. Having a boundary that delineates the geographic extent each ward is unique among most other religions. In the LDS Church, geography dictates which ward you attend. Examining why the lack of diversity is detrimental to the ability of a ward to function requires a brief overview of the concept of social capital. Social capital is a term coined by sociologists (and often used by city planners) to describe the exchange of goods and services that occur in a community among friends, family, and neighbors without an exchange of money. Here’s a simple example: A family with teenagers has their kids shovel the snow from the walkways of the elderly widow’s home next door, and in return, the widow bakes cookies for the family. The basic idea behind social capital is that everyone has strengths and weaknesses; we all have needs, and we all have something to offer others. In a community with a high level of social capital, much can be accomplished without actually exchanging a single dollar. Social capital tends to flourish in a diverse population, where the strengths of some can alleviate the weaknesses of others and vice versa. However, social capital struggles in homogenous populations, where everyone tends to share the same set of strengths and weaknesses. Religious communities perform many functions beyond saving souls, and the LDS Church is no different. Considering the previous paragraph, a LDS ward can be seen as a mechanism for fostering social capital. When a ward suffers from a lack of diversity, social capital struggles, which makes it more difficult for the LDS Church to achieve its commitment to welfare and self-reliance. It’s true that the LDS Church can and does transfer the abundance of donations from affluent wards to those wards that are in need; however, I feel that the redistribution of wealth functions much better when we can be personally involved in it. The more we become personally involved, the less we need formal systems for redistributing wealth. When we build communities that naturally encourage diversity and promote a natural redistribution of wealth, society has far fewer issues that need to be formally solved later on. Finally, a shout-out to LDS Earth Stewardship for the great conversation that I had with those who were tabling last Saturday at Salt Lake City’s Downtown Farmers Market. Hopefully, this post will help to show that stewardship is also critical for creating the proper human habitats. 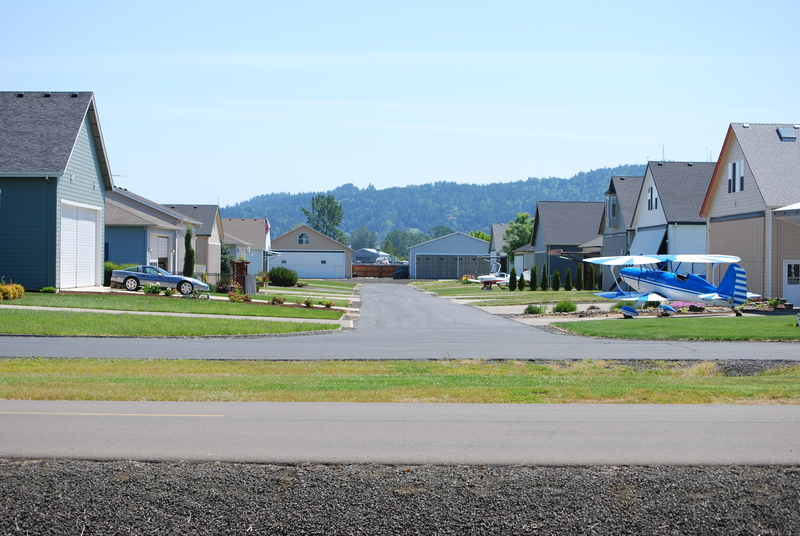 This entry was posted in Land Use, New Urbanism, Transportation on July 21, 2014 by Mike Christensen. The two photos below show the state of the pedestrian ramps nearest my home as of July 15: This wouldn’t be so much of a problem, if it weren’t for the fact that the pedestrian ramps have been in this same state for weeks! So, if you’re in a wheelchair, you’re forced out into the lanes of traffic in order to detour around the construction. And, if you’re in a wheelchair and need to cross the street, good luck trying to reach the button to activate the pedestrian signal. Once again this has been dragging on for weeks. 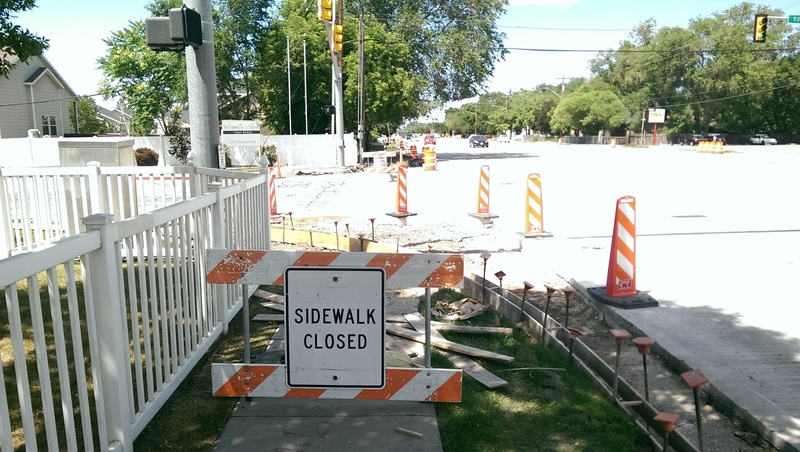 It’s obvious that UDOT has continued to view pedestrian facilities as a required formality rather than a legitimate transportation mode, which explains why few pedestrians can be seen walking along Redwood Road. I hope someday soon UDOT will shift its priority from moving cars to moving people. This entry was posted in Land Use, New Urbanism, Transportation on July 16, 2014 by Mike Christensen. While I trust Jeff Speck and his statement makes perfect sense to me, as I have mentioned it to my colleagues and classmates, they’ve basically told me “Show me the numbers!” So, earlier this week, I set out to actually quantify his statement. The first thing that I had to do was establish a relationship between gasoline and electricity. After some searching on Google, I found a nifty table created by the Alternative Fuels Data Center explaining the relationship among various fuels. Basically, the relationship is established by converting each fuel into British thermal units (BTUs) or, in other words, finding out how much heat each unit of energy produces. Burning one gallon of gasoline produces 116,090 BTUs. 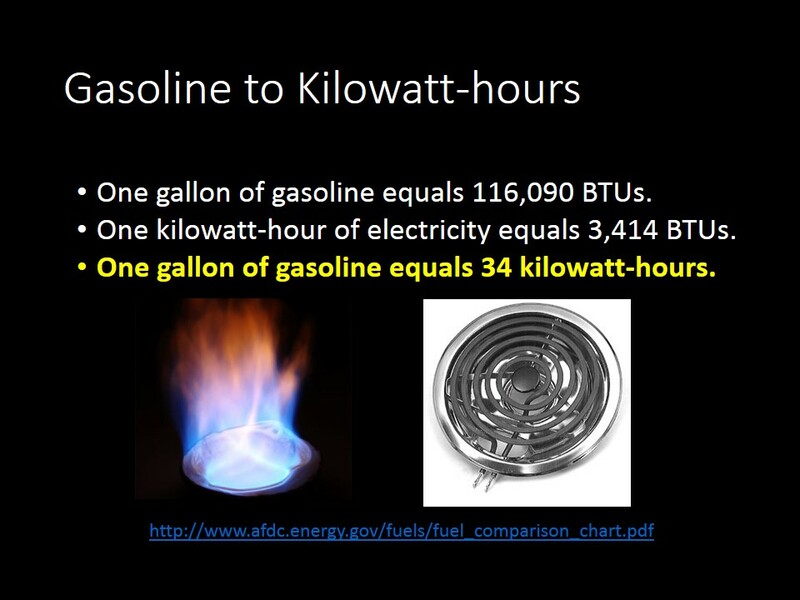 Applying one kilowatt-hour of electricity to a heating element produces 3,414 BTUs. This results in one gallon of gasoline equaling 34 kilowatt-hours of electricity. The next step is to examine household lighting consumption. 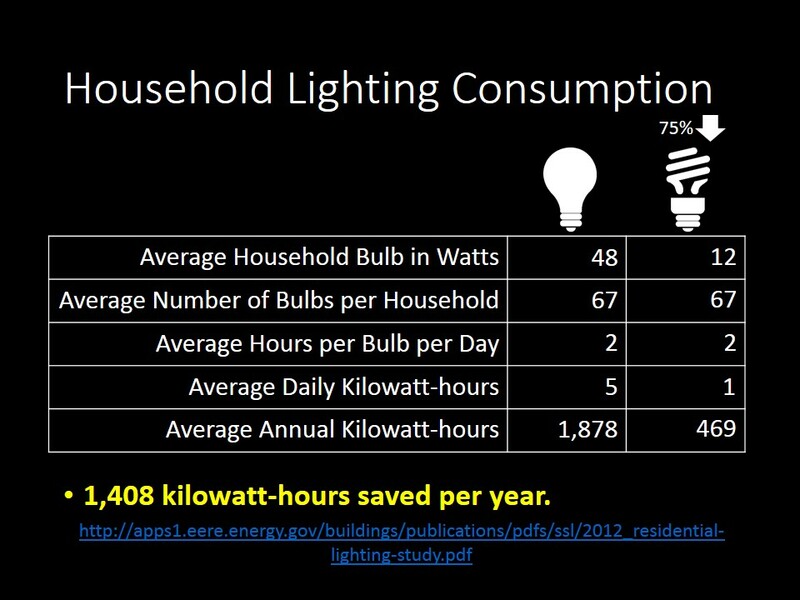 I found an interesting report from the Office of Energy Efficiency and Renewable Energy that outlines average household lighting consumption. When it comes to incandescent bulbs, the average household bulb is 48 watts. There are an average of 67 bulbs per household. On average each bulb burns for almost 2 hours a day. This totals around 5 kilowatt-hours per day or 1,878 kilowatt-hours per year. Assuming that compact florescent bulbs use 75% less energy than incandescent bulbs, this drops the average household bulb wattage to 12 watts. The average of 67 bulbs per household burning for almost 2 hours a day remains the same. This results in about 1 kilowatt-hour per day or 469 kilowatt-hours per year. Subtracting the two annual consumption amounts results in a savings of 1,408 kilowatt-hours per year. The final step is to examine household gasoline consumption. I found a useful table from the Energy Information Administration, which states that the average household gasoline consumption is 1,143 gallons per year or roughly 22 gallons per week. This translates into 741 kilowatt-hours per week. Let’s assume that the “walkable city” imagined by Jeff Speck allows its households to significantly reduce the amount of driving necessary by allowing its citizens to complete most of their travel by walking, biking, and riding transit. Let’s say it’s a 95% reduction. The result would be reducing the household gasoline consumption to 57 gallons per year or just over 1 gallon per week. This translates into 37 kilowatt-hours per week. Subtracting the two annual consumption amounts results in a savings of 704 kilowatt-hours per week. 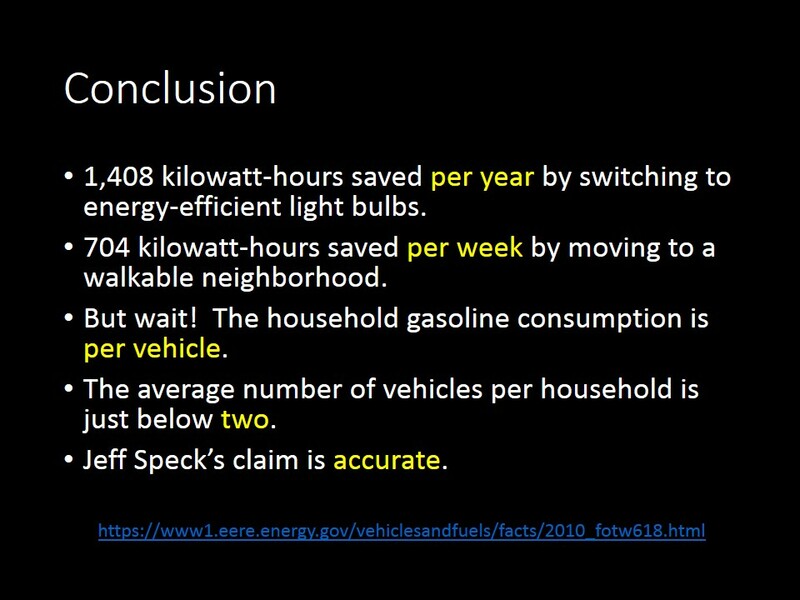 So in conclusion, the 704 kilowatt-hours saved per week by moving to a walkable city is only half the 1,408 kilowatt-hours saved per year by switching to energy-efficient light bulbs. But wait! There’s more! 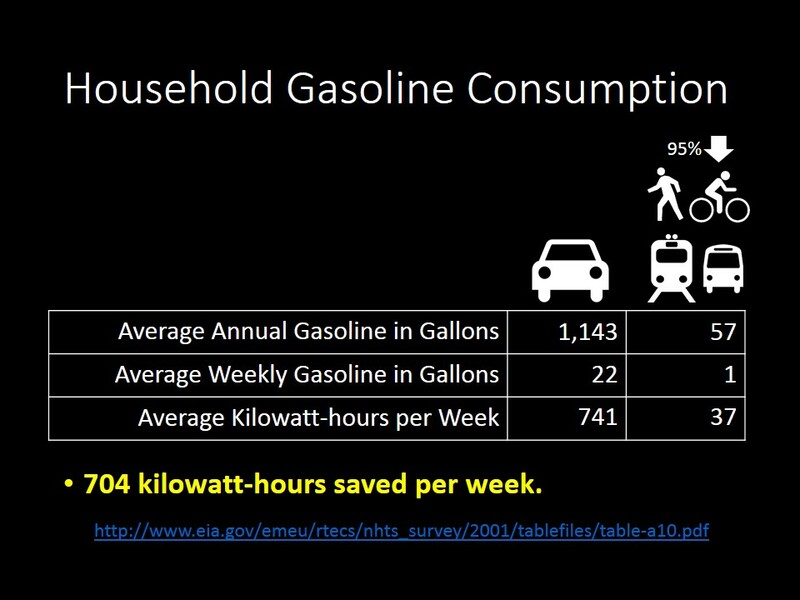 Upon taking a second look at that useful table from the Energy Information Administration, I discovered that the average annual household gasoline consumption is actually per vehicle. 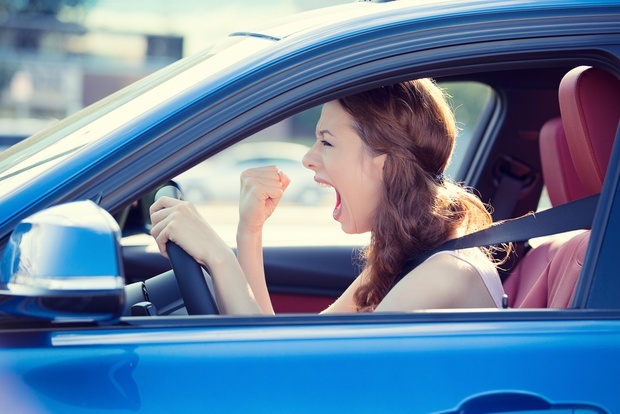 A quick search reveals that there are almost two vehicles per household according to this study also by the Office of Energy Efficiency and Renewable Energy. 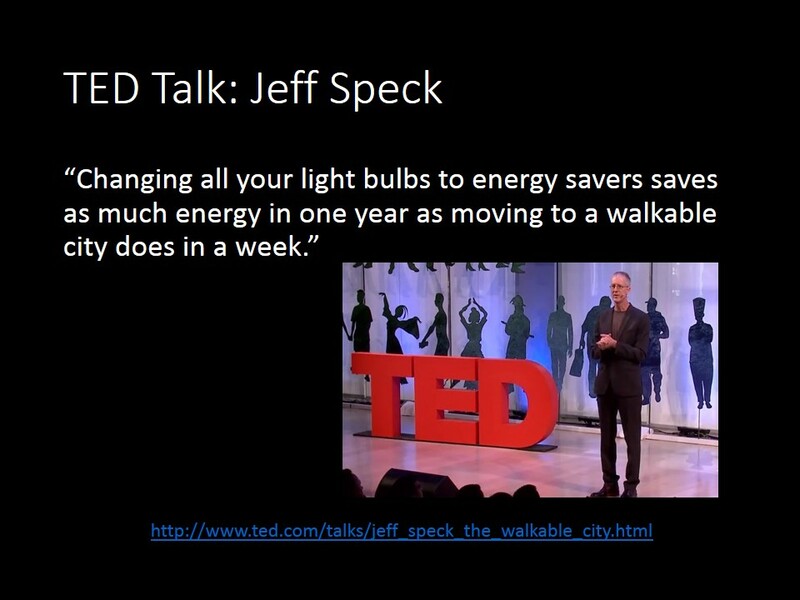 In the end, Jeff Speck’s statement that “Changing all your light bulbs to energy savers saves as much energy in one year as moving to a walkable city does in a week” is accurate! This entry was posted in Land Use, New Urbanism, Transportation on March 23, 2014 by Mike Christensen. For the final project of my Introduction to New Urbanism class, I had the opportunity to critique the Mississippi Renewal plan for the city of Gulfport. In August of 2005, Hurricane Katrina devastated several communities along the coast of Mississippi. In October of 2005, the Governor of Mississippi called upon leaders from the Congress for New Urbanism to lead the Mississippi Renewal Forum as an effort to create a plan to rebuild and revitalize the region. Below you’ll find my critique and the slides I used for my presentation in class earlier today. WARNING: I have never been to Mississippi, so my knowledge of Gulfport and the surrounding region is based on what I gathered from reading the Mississippi Renewal plans and other sources online. This entry was posted in Land Use, New Urbanism, Transportation on July 29, 2013 by Mike Christensen.